A student engages in problem solving when a problem or situation requires that student to develop an approach by transferring prior knowledge to the context at hand. Teaching problem solving is not the teaching of a set of things students should do, it is teaching a set of ways for students to see. I believe that this idea of transfer — taking what students know and finding a way for them to apply it in a new situation — relies on the student’s insight into the path to a solution, rather than giving them a list of “problem solving strategies” to fall back on when they get stuck. But this all sounds really abstract. I want to get into some concrete classroom actions that I can take to do this. As I put this list together, it seemed more and more to me just a list of good teaching practices, but with a very specific focus — building deep knowledge that students can use to draw connections between situations and solve increasingly difficult problems requiring transfer of that knowledge. I am focused less on what to do when students are working on difficult problems, but instead on some strategies to build the knowledge they need to solve problems independently. I have three ideas for how to do this. This is inspired by a really incredible Ignite talk by Grace Kelemanik at NCTM. The premise of her talk was pretty simple — the Common Core Standards for Mathematical Practice are not all created equal. First, we need problems that are worth making sense of and solving — Practice 1. Without problems worth solving, everything else falls apart. But students need ways of accessing these problems. Here, Grace turns to Practices 2, 7, and 8. Next, students need to be able to implement Practice 7, look for and make use of structure. In the classroom, this means looking for similarities between a problem and another problem — Grace gives the great example of realizing the 4/5 full is the same as 1/5 empty, and using that connection to facilitate a solution. Finally, students need to be able to implement Practice 8, look for and express regularity in repeated reasoning. In the classroom, this means looking for patterns and generalizing a rule based on those patterns. For instance, when finding square roots, realizing that the last digit of the square can be used to predict the last digit of the square root, and using this fact to refine a guess-and-check strategy. These strike me as excellent strategies, but not in the sense that they would be especially useful in solving problems. “Have you tried generalizing based on patterns?” seems to me far too general to be of use for very many students. Instead, I think these are the best avenues for teaching content in a way that promotes problem solving. When students contextualize and decontextualize, they build knowledge of the connections between a context and a broader mathematical idea, setting them up for having another insight later. When students identify similarities between problems and situations, they consolidate and deepen the knowledge they have, and create opportunities to apply it in new situations. When students generalize based on patterns, they make connections between individual examples and a broader rule that governs them and can be used to solve a different problem. As students build this deep, connected knowledge, they are putting themselves in a position to have similar insights in the future. This is much more humble work than much of what I have called problem solving in my class in the past — instead of finding lots of really hard, non-routine problems, I am using a variety of related problems and constantly looking for opportunities to push student thinking down these three avenues. This gives me three specific ways to build deep knowledge in students, and I think it is exactly that humble work that sets students up to be effective and successful problem solvers. I often hear references to the “ladder of abstraction” — the idea that students’ understanding begins with the concrete, and climbs a metaphorical ladder as it becomes more and more abstract. I think this is a useful metaphor, but is also incomplete. My thinking here is influenced by Daniel Willingham’s Why Don’t Students Like School, which devotes a chapter to the difficulty students have in understanding abstract ideas. His basic premise is that the mind prefers to avoid abstract ideas — we naturally try to understand things in terms of what we already know, and what we already know is mostly concrete. Abstract ideas can’t just be poured into a student’s head. Instead, students build deep, abstract understanding through the accumulation of lots of concrete examples, analysis of the similarities and differences between them, and a focus on the underlying structure that connects all of the ideas. Based on this perspective, I think the metaphor of a ladder of abstraction would be better replaced by a pyramid of abstraction. It’s a subtle difference, but I think a significant one. If I want students to build a deep understanding of functions, I need to give them as many concrete examples of functions as possible, and spend time analyzing the features of those examples that make them functions — moving toward abstraction, but doing so through a variety of examples, rather than jumping up in abstraction each time. If I want students to understand what the derivative means, I need to give them as many concrete examples of derivatives as I can, with and without context, as they build a flexible understanding of rate of change and its relationship with functions. I worry that the ladder of abstraction metaphor leads me to believe that, once a student understands one concrete example of a function, they are ready for a more abstract example. While some students may be, I want to focus on building a broad base first, and then moving up the pyramid after we have spent time analyzing the connections between the examples and the underlying structure. If the goal of the abstract idea is to be able to problem solve with it — to transfer that understanding to new situations and new problems — my students need a large number of examples to work from to build the knowledge they need to transfer. This is also an important example of a time when I want to do some of the cognitive work for students. It’s fashionable as a math teacher to brag about how little help we’re giving our students, and how we’re making them do the hard intellectual work. I’m all for that, but not as dogma that supersedes everything else. In this case, when I’m at the bottom of the pyramid of abstraction, I want to put students in positions to make connections between concrete examples — and if students don’t make those connections themselves or in small groups, I want to explicitly teach them to do so. If I am introducing concrete examples without building the connections to the deeper concepts, there is no pyramid of abstraction, just some scattered and disconnected bits of knowledge. These connections are the building blocks of knowledge transfer, and it is my responsibility to make sure students make them. I think one critical goal of hints has to be to build a student’s belief that they can solve problems themselves — that they are sense-makers, and capable mathematicians. This perspective is important, and is a rational reason to use restraint when giving students hints. That said, I think there are important times when we need to do a bit of the work for students, in order to build the knowledge they need to actually be the effective problem solvers we are looking for. I have two criteria for hints that do some of the work for students, but I think build critical knowledge students need to be problem solvers. First, if a student is missing a piece of mathematical structure or context, my hint should do some of the work of making that connection for them. If they don’t see that a situation corresponds to a mathematical tool, pushing the student to make that association rather than struggling blindly sets them up to make more associations with that tool in the future. If they don’t see how a problem is similar to another problem they can solve, my hint should point them in that direction. Fundamentally, the goal of hints needs to be to promote learning. If, without a hint, the student is struggling blindly, they aren’t learning. If, without the hint, they are likely to just copy the answer down during a discussion, they aren’t learning. If, without a hint, they aren’t making the mathematical connections they need, they aren’t learning as much as they could be. Hints that serve these purposes can be subtle and push students to do a great deal of the work — but a broad fear of robbing students of thinking can lead just as easily to confused students who aren’t learning, and I want to make deliberate decisions around exactly how much help to give. Second, if a student can’t figure a problem out, but knows the information they would need to solve it, I need to give it to them. If a student is close, and I can push them to articulate exactly what they would need to solve it, I need to give it to them. If a student is solving a geometry problem, and just needs to figure out the length of one missing side of a right triangle, and can articulate that if they just knew how to do that they could solve it, I should give them the Pythagorean Theorem in that moment. That’s a bit of a silly example and rarely happens in real life, but I think the principle is an important one. I can push students to articulate what they would need to know to solve it. At that point, they have built the mathematical structure they need for that missing piece to be a durable part of their knowledge, and it is my responsibility as their teacher to fill it in for them. And, as students build a habit of figuring out what they need to know to solve a problem, they build for themselves tools that will allow them to use their resources effectively to solve new problems in the future. Looking back on this post, and my thinking on problem solving over the last few weeks, I feel like I’ve moved away from almost everything I’ve previously thought. I’m focusing much less on some specific things that I do while students are working to teach them problem solving. I think that the quiet work of building knowledge is at the center of effective student problem solving. I want my students to be mathematicians who look at a problem, draw carefully on their knowledge, and see a path to a solution. I’ve used a few words and phrases over and over again in this post — connections, deep knowledge, transfer. These all come back to the same idea. If I want students to be problem solvers, I need to pick the types of problems I want them to be able to solve. I need to teach that content, and teach it in a way that builds abstract concepts that students can apply in new contexts. I need to select problems deliberately, moving up the pyramid of abstraction. And I need to provide appropriate support — not doing too much work for the students, but not leaving them struggling blindly for fear of doing any work for them at all. And, over a whole lot of years of education, students will build expertise in math, connect concepts into broader and broader mathematical ideas, and become expert mathematicians. I think, as a final note, it’s important to mention that many students do this themselves. Some students are sense-makers, incessantly questioning, clarifying, sorting new ideas and making connections with old ones. A happy, engaged classroom makes all of that much more likely. These are the students who impress teachers with their insights year in and year out. I’m not writing this post, or clarifying my thinking, or changing my teaching, for those students. They will be fine. But there is a significant subset of students who struggle to make sense of math, struggle with their beliefs in themselves, and don’t have that positive feedback loop of mathematical success. These are strategies that I think are critical for working with and teaching these students — building their knowledge deliberately and giving them a chance to become problem solvers as well. This entry was posted in Problem Solving on June 25, 2015 by dkane47. I used this definition to make two distinctions. First, I don’t believe that puzzles are necessarily problem solving. While something like the “farmer crossing the river” problem might be fun to do with students, it doesn’t meet the criteria of transfer to or from other mathematical problems (at least from my K-12 perspective). I am labeling it a puzzle rather than a problem — useful in certain situations, but also not directly relevant to the point of this post. I am also deliberately including any problem that requires transfer of prior knowledge, which depends on the perspective of an individual student. Rather than labeling something a “problem” because it is different from conventional problems in that area of content, I want to consider the students’ response to the question — simple questions can require transfer and problem solving depending on the student’s knowledge. Using this definition of problem solving, I came to a goal that I think can encompass all of math teaching: my goal is for students to learn mathematical content in such a way that they are able to transfer their knowledge to new problems and new contexts as their knowledge grows. This positions problem solving as a spectrum — building from the straightforward and everyday to the complex and profound — and expecting that as students build their knowledge, they climb this ladder step by step, rather than expecting students to suddenly solve rich problems without proper support. Claim: Teaching problem solving is not the teaching of a set of things students should do, it is teaching a set of ways for students to see. The most startling and controversial aspect of our results have always been the finding of case specificity and the lack of intraindividual consistency over problems, with the accompanying implication that knowledge of content is more critical than mastery of a generic problem-solving process (292). Which, to me, means the evidence indicates that doctors do not gain domain-general diagnostic expertise that can be applied in any area of medicine — they have expertise in fields where they have knowledge, rather than transferring skills general to diagnostic medicine to any new field. 1) What is the question asking? 2) What path will I take to solve it? 3) How do I execute the mathematics to move to a solution? I would argue that we spend too much of our time having students memorize treatments — multiplication, solving proportions, completing the square, the chain rule. These are not trivial skills, and facility with them allows students to adapt them in new situations, or pause and try a new approach when a solution has gone astray. But they are only one link in the chain of problem solving. I think the heart of teaching students to transfer knowledge when solving problems is insight. This is the moment when they see that the path from where they are to where they are going lies in a particular mathematical tool. It could be a 3rd grader realizing that a word problem corresponds to multiplication, or a 6th grader realizing that finding a unit right and multiplying can lead to the cost of a product, or a 9th grader realizing that the ball hits the ground when the function is equal to zero, which means he will need to factor. These are, fundamentally, connections between mathematical concepts and contexts — mental models that allow students to see how their knowledge can fit into a solution. And for students to solve more complex problems that require unusual reasoning, a deeply connected base of knowledge allows them to see the missing pieces that they need in order to problem solve. This proposition is pretty interesting to me by itself, but in the spirit of deep, connected knowledge allowing us to solve problems, I want to put together some of the ideas that have helped me clarify my thinking. The dilemma we see is that, on the one hand, short lists of descriptive processes (i.e., the conventional problem solving strategies) appear to be too general to be meaningful for instructional purposes; on the other hand, long lists of prescriptive processes (i.e., more detailed and specific problem-solving strategies for classes of problems) tend to become so numerous that knowing when to use them becomes the heart of understanding them (769). This list of problem solving strategies, from Polya, rings true for mathematicians as a useful way to describe problem solving process. But, as Michael writes, these strategies are usually too big to help novice problem solvers, unless the problem solver is told which strategy to use, which seems to remove the fundamental criterion of transfer of learning from the problem solving experience. If, instead, we look at these strategies as reflections of what students are capable of doing when they have the knowledge to see a new or unusual solution path, they open up new ways for us to teach students that knowledge. Good problem solvers know more than poor problem solvers and what they know, they know differently — their knowledge is well connected and composed of rich schemas … Good problem solvers tend to focus their attention on structural features of problems, poor problem solvers on surface features (507). [Structure building is] the act, as we encounter new material, of extracting the salient ideas and constructing a coherent mental framework out of them … High structure-builders learn new material better than low structure-builders. The latter have difficulty setting aside irrelevant or competing information, and as a result they tend to hang on to too many concepts to be condensed into a workable model (or overall structure) that can serve as a foundation for further learning (153). Structure building seems like a great phrase to encapsulate what it is that experts do and novices do not — but in a way that shows us the transition from being a novice to an expert. This constant process of making sense of new material by identifying the most important details and connecting them to prior knowledge seems to me like the heart of building expertise in any area, but in math in particular. And as that structure is built, students have more and more resources to bring to bear on a new problem, identifying which structure that problem fits into, and how that might lead to a solution. The ideas that mathematics must be taught in a way that enables novice learners to organize it into a highly interconnected, coherent schema or body of knowledge, that novices don’t necessarily have the skills to learn the way experts do (let alone the motivation or disposition/mindset, both of which have been shown to have huge effects of ability to learn), and that novices do have problem solving skills that they haven’t been taught but are rather part of their birthright as thinkers, suggests to me that there are different conclusions to be drawn from studies showing that minimal guidance is not effective and generalized problem solving skills aren’t what separates novice from experts. The conclusion I draw is that problem-solving is a tool to be used in the service of learning content, and that content in turn becomes a tool to solve more and more interesting problems. Max is hitting a few points mentioned earlier, but the big insight here for me was that novices do have general problem solving skills — students are capable of guessing and checking, or solving a simpler problem, or drawing a picture, even without having been explicitly taught. I love the idea of problem solving strategies as students’ “birthright as thinkers”. But they can only apply these strategies when they have the knowledge to support their use — and their use in turn furthers their knowledge. I’m still agnostic on instructional technique, in particular thinking about the inquiry vs direct instruction battle. I have my opinions, but I’m going to hold off on judgment because, given my experience, I think those opinions lack the knowledge and evidence to feel confident in them from an instructional standpoint. There are also pieces I’m missing. Growth mindset and grit fit in here somewhere, as does metacognition. These ideas are lacking in concrete classroom application. While I may have a better idea of what I mean when I talk about problem solving, I still don’t have great tools to move students toward these skills. But thinking back to my logic in teaching problem solving a few months ago — which mostly consisted of finding hard, non-routine problems and putting them in front of kids, and doing my best to get students engaged — I think this is a huge step in my knowledge of what I need to do to promote expertise in problem solving among my students. While I’m not ready to make sweeping statements on mathematical pedagogy, I do have a few ideas that I think I can use to apply this approach to problem solving in the classroom. Those will be coming soon. This entry was posted in Problem Solving on June 14, 2015 by dkane47. There must be nearly as many definitions for problem solving as there are mathematicians and math teachers. I am not going to pick through each of them, but I do want to present my own, as I try to clarify what I mean by problem solving and what I want it to look like in my classroom. Here’s my stab at it. This seems pretty simple, but I want to pick two fights here. A farmer wants to cross a river and take with him a wolf, a goat, and a cabbage. There is a boat that can fit himself plus either the wolf, the goat, or the cabbage. If the wolf and the goat are alone on one shore, the wolf will eat the goat. If the goat and the cabbage are alone on the shore, the goat will eat the cabbage. How can the farmer bring the wolf, the goat, and the cabbage across the river? Maybe this breaks your heart. But thinking about problem solving in school mathematics, I don’t think it fits — I would label it a puzzle instead. Maybe there are connections that I am missing to the mathematics that my students are learning, but when I think about the insight necessary to solve this problem, I don’t see it as a principle that connects with the mathematics that K-12 students are asked to do. This is a difficult problem to solve, but I would argue that mathematical skill is neither necessary nor sufficient to solve it, and that the learning from solving the problem does not transfer to future mathematical skill. The solution does require a sort of cleverness that we always hope our students exhibit, but I don’t see a concrete connection between that and helping students become expert K-12 mathematicians. I do think puzzles have value in giving students opportunities to be metacognitive or growth mindset oriented, or just to enjoy math class, and I think many puzzles do this well. I still don’t want to call them problem solving. This might seem like a silly distinction, but as I put together my ideas for how I want to teach problem solving, I see the cognitive activity that goes into solving this problem, and problems like it, as different from the daily problem solving I hope to see from my students. My definition also deliberately includes any math problem that requires transfer for a student to solve. Solving the equation 5 – x = 3, or finding 15% of $24.00, could be problem solving for a certain student in a certain situation. 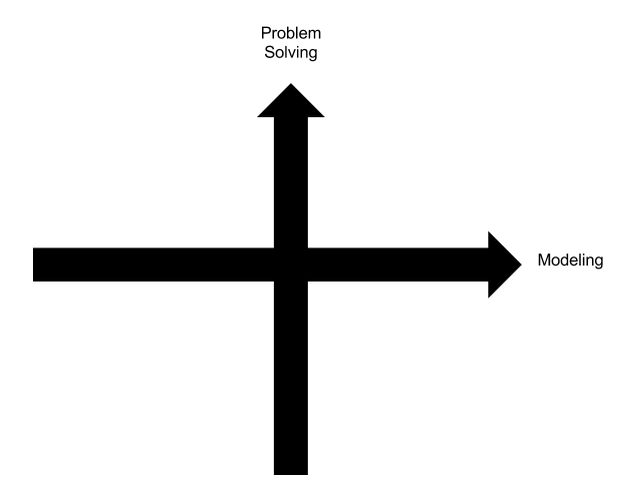 I want to move away from the dichotomy between “problem solving” and “not problem solving”. I believe that the skills and mindsets of problem solvers are the ways that students should be learning and practicing math every day. I don’t want to single out any specific problem as problem solving because I think that the basic idea — considering what prior knowledge applies to a new problem — should just be what we do in math class, beginning with the more concrete and specific and moving toward the abstract and general as study on a topic progresses. We should be posing students with problems of varying difficulty, that require varying degrees of transfer, every day. A mindset of “now we’re going to do some problem solving” seems to imply that whatever it is we do to facilitate student problem solving does not apply to “normal” math. I think that it also leads teachers, in the name of “teaching problem solving” to give students problems that are too difficult too fast, or spend too much time on simple problems to “build the foundation” before throwing students into the deep end without the supports they need. But the degree of transfer is what I am focusing on here, and if I want to put together a set of ideas ready to use in my classroom to teach problem solving, I am going to narrow my perspective to that axis — to what degree must the student transfer prior knowledge in order to solve the problem. I’m deliberately moving away from what is usually “problem solving” in conversations in the faculty room. I think that this conception of problem solving focuses too much on the cleverness of the problem and the novelty of the context, and too little on the way a student interprets the problem and the relationship between the problem and the mathematics being learned. I don’t think those problems I am labeling puzzles are useless, but I think they sideline “problem solving” to be “something different” rather than a cohesive part of math class, woven in with content instruction. While this definition is useful for my purposes right now, I’m working to build from it a coherent idea of how I think problem solving can be taught, and what that can look like in my classroom. Check back to see where I end up. This entry was posted in Problem Solving on June 9, 2015 by dkane47. There have been some great thoughts on hints recently. Michael’s talk at Shadow Con, Henri’s thoughts here and here, Annie here, and many more on blogs and especially on Twitter. This is my attempt to take a lot of really big ideas and pare them down into something I can put to work in my classroom. What do you know, and what are you trying to find out? If you knew how to solve this problem, what would you do? I think these are great, and there are plenty more out there, but I don’t want an endless list of all the possible hints. Instead, I want some general rules for how and when certain hints cause learning. Let’s start with the idea that the goal of a hint should be to promote mathematical thinking. How can we take these hints and create something concrete and useful for teachers? Locus of Attention – Feedback can draw the student’s attention towards something that matters for their learning. Motivation – You can ask a student to do something that they otherwise wouldn’t do. If a student has not attended to all of the relevant features of a problem, and will not on their own, they are in need of a hint. These come in all shapes and sizes, from “what do you notice?” to “what are the givens?” to “what does _____ mean?”. An important feature in the research on expertise and problem solving is that experts focus on structural features of problems, while novices focus on surface features. One of the roles of the teacher is to promote this type of thinking by redirecting student attention when appropriate. This is the heart of learning — taking a problem, and relating the mathematics of the problem to the mathematics a student already knows. It’s also the most sensitive — I think if we are doing work here for the student, we are taking a great deal away from their learning.The goal is not just to solve the problem — “use this thing you’ve learned before” — the goal is for the problem to connect with students’ prior knowledge — “this is how and why the problem is related to that thing you’ve learned before”. If we make the connection for the student, they are less likely to make the connection. All that said, I think these hints have a place, and can be posed to promote thinking. I really like these hints. “What have you tried so far?”, “What else could you try?”, “What are you doing?”, “How does it help you?” I think it’s important to note that this type of metacognitive hint is not always productive. It could interrupt students on the way to a solution, or cause them to second-guess useful ideas. I also think that an important features of these questions is that, in the end, they are often just refocusing student attention on features of the problem or their prior knowledge. Alan Schoenfeld has some great writing on metacognition, including classroom experience applying these hints. Students need to be believe they are capable of solving problems in order to do so — go check out Carol Dweck and Jo Boaler’s work on the topic. This is usually wrapped up in another hint, and it’s essential features is that it does not do work for the student. Our hints send messages about the way math happens, and they must consistently send the message that students are have important mathematical ideas and are capable problem solvers. Questions like “What do you notice? What do you wonder?” promote this mindset if students can successfully solve the problem — we create a positive feedback loop of student success when we put them in situations to be successful problem solvers, whether that means solving the problem, or highlighting the great ideas that students produce. This is the trickiest one, but I really believe it’s essential. Imagine a student needs to apply the Pythagorean Theorem to solve a problem. You ask them a few questions, and they are very clear — “I need to figure out this side length, and I know there’s a formula to find the third side of a right triangle, but I forget it.” They know what they piece of knowledge they are missing is, and they know where it fits, both into the problem and the rest of their mathematical knowledge. It seems like a waste of time to have them ask another student, or to search through their notes — I’m skeptical that doing so is fundamentally different from just telling a student. This situation is rarely cut-and-dry, but I think there is an important place and time for acknowledging that a student needs more information in order to solve, and just giving it to them. This feels more concrete to me, in particular for categorizing what a student needs to solve a problem. I still think I need more specificity, and more examples of what these hints might look like in action, in order to have an impact on my teaching. I’m not sure how much farther I want to take this line of reasoning, but a next step might be to pick a task and plan what each of these hints might look like in that task, and then to see how effectively I can identify where a student is falling short in order to provide a useful hint. This entry was posted in Problem Solving on June 6, 2015 by dkane47. We can argue back and forth about “inquiry” vs “direct instruction” forever. And people do. I’ve come to dislike the term “inquiry” because it means different things for different people, and acts as a lightning rod in math education. This post is an attempt to move away from buzzwords and toward something meaningful I can use in my classroom, and be confident will make a positive difference in my students’ learning. Studies of the use of mathematics in everyday situations, such as people making decisions in grocery stores (e.g. Lave, 1988), have revealed that mathematics as taught in school is seldom used. Rather, people generally develop and routinize their own algorithms to accomplish everyday tasks — constructing their knowledge locally and situated to the specific context (766). I was pretty curious about this, so I decided to dig a little deeper. I badgered a few coworkers, both math and non-math teachers, into showing me how they give tips in restaurants — actually doing the math how they normally would, and talking through their thought process. I was fascinated by what I learned. First, most teachers explained what they were doing in a very simplistic way. A majority moved the decimal over one place, to find 10%, then rounded to the nearest dollar, and doubled it. Done. But, when I chose examples meant to challenge this algorithm, they adapted. For instance, when presented with a bill of $26.31, most teachers moved the decimal, implicitly rounded to $2.50, then doubled to $5. This was fascinating — what math teacher teaches kids how to round to the nearest half of a unit? But, interestingly, when I presented them with $27.31, many rounded up — despite the fact that $2.50 is closer to 10% than $3.00, they realized that the tip rounding down was lower than they wanted to give, and rounded up in response. Other teachers used a much more complex algorithm. They estimated the tip necessary, then rounded the total (bill + tip) to the nearest dollar, usually rounding up, but in some cases rounding down, in order to keep the tip as close to 20% as possible. Again, these teachers struggled to articulate the exact series of decisions they were making, despite their apparent mathematical complexity, and consistency over multiple calculations. Some teachers calculated exactly 20%, the way we might teach in school — but interestingly, every one of these teachers is a math teacher. My sample size is too small to draw any real inferences about that, but I think this underscores the point that people are capable of creating their own algorithms, if every non-math teacher can do so. Most notably, almost every teacher calculated the tip quickly and confidently, with the one exception getting nervous because she thought I was going to judge her for “doing it wrong”. And there was a great deal of complexity in these calculations, with a huge number of implicit decision trees and mathematical calculations, both conventional and unconventional, much of it happening subconsciously. All people are capable of building their own algorithms and gaining expertise in an area through algorithms they invent and practice without explicit instruction. This is a critical thing for people to be able to do, whether through school mathematical topics or otherwise, in both everyday and professional aspects of their lives. If our students will need to do these things, and are capable of doing them, we need to be asking them to do them in our math classes. More than that, I think these experiences are joyful and growth mindset-oriented for students. I have never ever ever had a student email me and say ‘I just spent a week binge watching Khan Academy videos, and it was amazing’. But I did have a student … send me an email and he said look, I made this boat. And he didn’t make it for a badge, he made it because making things is amazing. That’s a pretty powerful anecdote for me. …let’s do this. Let’s imagine we sat down for coffee and wrote down all of our favorite verbs from 8th grade math – the best actions a student should be able to perform at the end of their year. We rank their importance also. We shelve our disagreements about when and how students should learn how to do those verbs. We agree that summatively, to be stamped proficient in 8th grade math, students should be able to do them. This is my “elevator speech”, if I have one, for my approach to inquiry in math class. I don’t want to label myself an “inquiry” teacher — I’m not sure I know what that means, or can say with anything more than my intuition that it works for students. 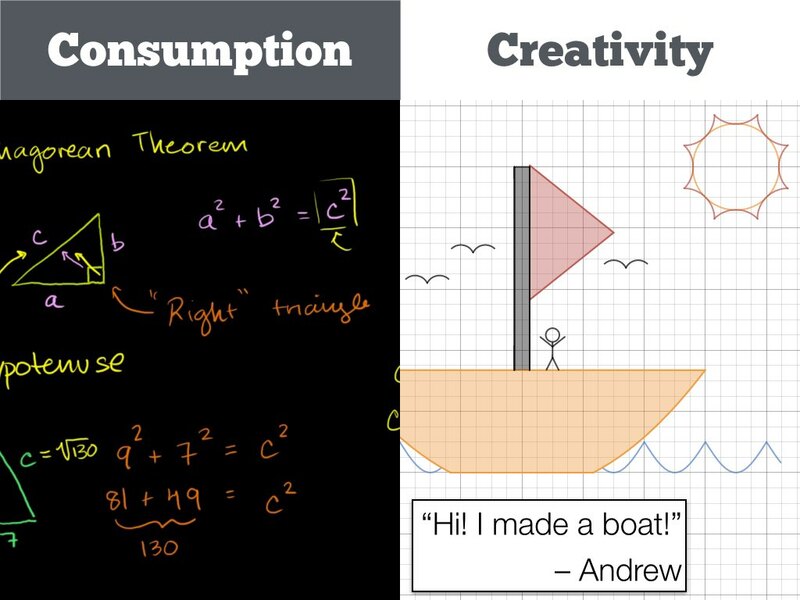 I do want to label myself as a teacher who teaches math by asking students to create, explore, argue, reason, experiment, and just generally figure things out. If my students are going to come away from my class able to do these things, I need to put them in a position to do them on a regular basis. Maybe doing these things fits your definition of inquiry. Maybe it doesn’t. But these are the verbs that I am going to work to prioritize in my classroom. Is this practical for improving my everyday teaching? I’m not sure. It feels like a useful way to think about a lesson, but I think I can get more specific and concrete. Lots of work left to do. 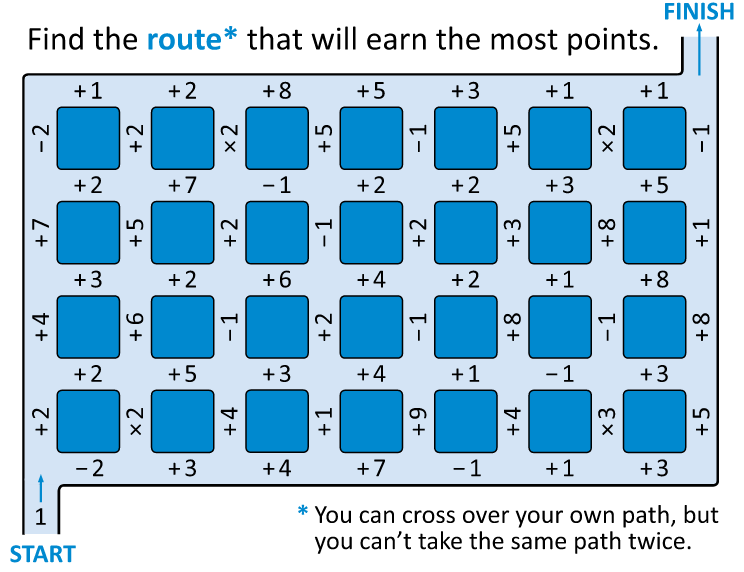 This entry was posted in Problem Solving on June 3, 2015 by dkane47. It is a curious and unsettling process, the business of changing your mind on a subject about which you had very positive convictions. I made a significant change in my teaching this spring. About four months ago, I committed myself to a new weekly system, where each Friday I would come to class with 3-5 worthwhile problems for students to solve. Students worked individually and in groups, solved, constructed an argument, critiqued each others’ work, and revised. We usually got through about 3 problems in a 50-minute period. And I made a deliberate effort for these problems to be non-routine — that is, a range of topics from our course, from problem-solving scenarios drawing a variety of math, and puzzles that provided opportunities for mathematical argument and discussion. I drew these problems from all kinds of sources — Play With Your Math, Dan Meyer’s Three-Acts, problems I wrote, and others found scouring the internet. I really enjoyed teaching these classes — and a number of my students did too. Since then I have done a great deal of thinking and reading about learning, and have formed some new opinions. This is a rough overview of how some of my opinions have changed these last four months. Make It Stick is a great book about the structures and routines that help learning. The first point that was really salient for me was the importance of spaced practice and distributed practice. The wisdom of spaced practice seems self-evident — we all know that cramming leads to less retention than spreading studying out over a period of time, and there is a great deal of research that supports this. The research on distributed practice was much more interesting to me. One example comes from the baseball team at Cal Polytechnic. They split their batters, randomly, into two groups for six weeks. The first group did batting practice according to their usual regimen — each hit fifteen curveballs, then fifteen fastballs, then fifteen changeups. Each round, they got better at timing their swings and making contact, and learning felt easy. Players in the second group were given forty-five pitches, where the three types of pitches were interspersed randomly. At the end of the round of practice, these batters were still having trouble making contact, and practice felt more difficult and less successful. However, at the end of the six weeks, those who had practiced without knowing which type of pitch was coming hit significantly better (80). The authors of Make It Stick attribute this improvement to the cognitive demand on the batters during practice — practicing without knowing what pitch is coming is harder and may not be pleasant, because of the increased cognitive demand, but it is exactly that increased cognitive demand that leads to durable learning. This is what the authors call a “desirable difficulty” — that when things are difficult, as long as they are still achievable, learning is stronger. This seems to support non-routine problems in math class on a regular basis. Cool. Let’s cut to the next piece of Make It Stick that really resonated with me, and that’s the idea of structure building. This gets at the heart of learning math for me. If students are to go beyond producing in math class to gain mathematical expertise, that expertise comes from seeing connections between concepts, and using them to solve problems. That structure-building is what I want students to do. This obviously can’t happen if we take the assembly-line approach to math learning — today we are learning multiplication. Instruction, practice. Then we do division. Instruction, practice. If students are to build structure, to reinforce mathematical connections in their minds and gain deep, flexible, mathematical knowledge, we must be constantly putting students in the position of creating these connections. Some measure of distributed practice is absolutely necessary to make this happen. But here is actually where I started to fall off of the non-routine problem train. I’ll come back to that point in a moment. Next up, problem solving. This is an absolutely amazing article surveying the literature on problem solving in math class, and draws some fascinating conclusions that I am still sorting out. There are a huge number of insights here that have influenced me, but I’m going to focus on two in particular. …research has not linked direct instruction in these strategies to improved problem-solving performance … Perhaps one reason is because using a strategy, such as draw a picture, assumes that a student would know what pictures to draw when, under what circumstances, and for which type of problems … Our interpretation of Polya’s heuristics is that the strategies are intended to help problem solvers think about, reflect on, and interpret problem situations, more than they are intended to help them decide what to do when “stuck” during a solution attempt” (768). I think this critique is right on. These problem solving strategies are not useful in the sense that “teaching” students a strategy will make them a better problem solver. They are useful in that they provide a framework — a structure, if you will — for students to make connections between mathematical problems that consolidate understanding and better prepare them to solve similar classes of problems in the future. Michael Pershan would go a step further, and I agree with him, in that strategies like Polya’s are too general to be of use to school students. We can’t teach “Solve a Simpler Problem” — students lack the knowledge and structure to use this as a connection to build while problem solving. Even narrowing it to geometry, and specifying that students “Chop a Shape Into Simpler Ones”, may still be too broad for students to make worthwhile connections — they must first build up examples of the strategy in trigonometry, area, auxiliary lines, and more, before they have a structure that can reach the generality of the strategy “Chop a Shape Into Simpler Ones”. This blew my mind a little bit. Doctors making diagnoses — which has to be one of our best examples of expertise in a field — don’t show a significant domain-general problem solving ability, and it instead seems to be a function of their content knowledge for that specific case. If something similar is the case in mathematics, it suggests that any goal of teaching domain-general problem solving strategies that may apply to any mathematical problem is a fruitless exercise, and we should instead be focusing on deep content knowledge in different areas of mathematics, and the strategies and perspectives directly relevant to that content area. Lesh & Zawojeski note that research suggests two other areas that influence problem solving. The first is metacognition — students actively monitoring their problem solving processes, in particular thinking about why they are employing the strategies they choose, and noting when they are following an incorrect path and reversing course. The second is student beliefs toward math, for instance having a growth mindset toward their mathematical ability. While these two may be relevant, they were not my original intention in teaching through non-routine problems, and I am going to put them aside for now. 2) They are situated in a sequence where meaningful connections are being made between content areas to deepen understanding. Non-routine problems are not useful “per se” — they do not teach math in and of themselves, but as a tool to reach other ends. I came to this conclusion from the perspective that math learning is all about the connections and the structure that students build in their minds. If math is a set of isolated skills, students will struggle to apply concepts and consolidate new knowledge. Solving non-routine problems may present opportunities to make connections across content areas, and these connections may be really tempting for teachers, but students’ knowledge must be build from the ground up. A teacher may look at two disparate problems and see what they have in common — maybe a math teacher sees the two problems below as two connected examples of problems where it is useful to work backwards. But I’m skeptical. I think that students who are still novices mathematically lack the knowledge structure to make this connection. Instead, students need to encounter problems that make connections at a smaller level, and build knowledge systematically — deep content knowledge first, and strategies coming alongside and after as student knowledge develops. I am rethinking what I want to do with non-routine problems next year. Providing students opportunities for distributed practice will absolutely be a priority — but this will be distributed practice that is deliberate and focused on content knowledge first, rather than prioritizing “non-routine” as a factor in choosing problems. I will also continue presenting non-routine problems to my students, but with a focus on problems directly and concretely related to the content we are learning at the time, whether through an adjacent problem type, a contrast with the previous day’s focus, or an analogous solution method. Non-examples and new problem types that build connections and distinctions between content areas are critical, but I will plan these in the context of a unit, choosing problems so that the connections I am asking students to build are revisited and reinforced over a period of time, rather than coming up haphazardly in a way doesn’t encourage structure-building. This will not look so radically different. But the major change is that these problems will be interspersed day by day, rather than concentrated all at once, and that I will choose problems for their value in teaching content first, rather than an abstract idea of the usefulness of non-routine problems. I love the work of Mary Bourassa, Alex Overwijk and others on a fully spiraled curriculum. I admire them for this, but I don’t feel like my curriculum knowledge is there. A fully spiraled curriculum provides different opportunities and different challenges that may make this argument inapplicable. I don’t know enough about how to teach students metacognitive strategies to monitor their problem solving, or how to effectively teach growth mindset. I think non-routine problems may have a place here, but I also think there are valuable opportunities to address these goals through content, and I don’t want to make non-routine problems a regular and significant part of my class solely for the purpose of metacognition and growth mindset. I don’t know what the impact is on student engagement. A number of my students — although mostly high achievers (I might say high structure-builders) enjoyed my Friday non-routine problem days. Maybe this engagement spilled over, and was worth the time spent on it. I don’t know how to teach problem solving. I’m puzzling through this at the moment. I think there are some important connections, and this post is helping me put my ideas in order. I have some definitional problems here. “Non-routine”, “problem solving”, “content knowledge”. I think I have a good idea of what I mean, but is there a shared understanding among math teachers on these ideas? I doubt it. Maybe a future project. That’s what I got. I’m curious for thoughts — what am I missing? What other research is relevant? What are other experiences with these types of problems? This entry was posted in Problem Solving on June 2, 2015 by dkane47.